Previously problematic point sources of pollution may still pose threats to water quality. 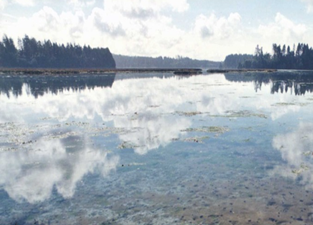 Outside of some known “pollution pockets” in the Coos estuary, it appears that concentrations of dissolved pollutants generally meet USEPA standards. Many streams in the study area are listed under Section 303d of the Clean Water Act for insufficient information. More comprehensive monitoring is needed to fully assess the status of other pollutants in the Coos estuary. Total organic carbon (TOC) is an indicator of the presence and abundance of organic compounds in the environment and is found naturally in estuary waters and sediments. High TOC levels are often associated with the presence of other pollutants, including the toxic by-products of organic decomposition (ammonia and sulfide)(Hyland et al. 2005). Additionally, dissolved organic matter binds with metals such as mercury (Swett 2010) and other pollutants, including pesticides and herbicides (Wijayaratne and Means 1984), as well as polychlorinated biphenyls (PCBs)(Brownawell and Farrington 1986). Consequently, TOC (more specifically the dissolved organic carbon (DOC) component of TOC – see below) may facilitate pollutant transport between sediments and the water column (Swett 2010). TOC may also result in harmful byproducts (i.e., trihalomethanes) during the water treatment process (Fleck et al. 2007). The presence and abundance of TOC is often used as an indirect measure of water quality and sediment contamination. 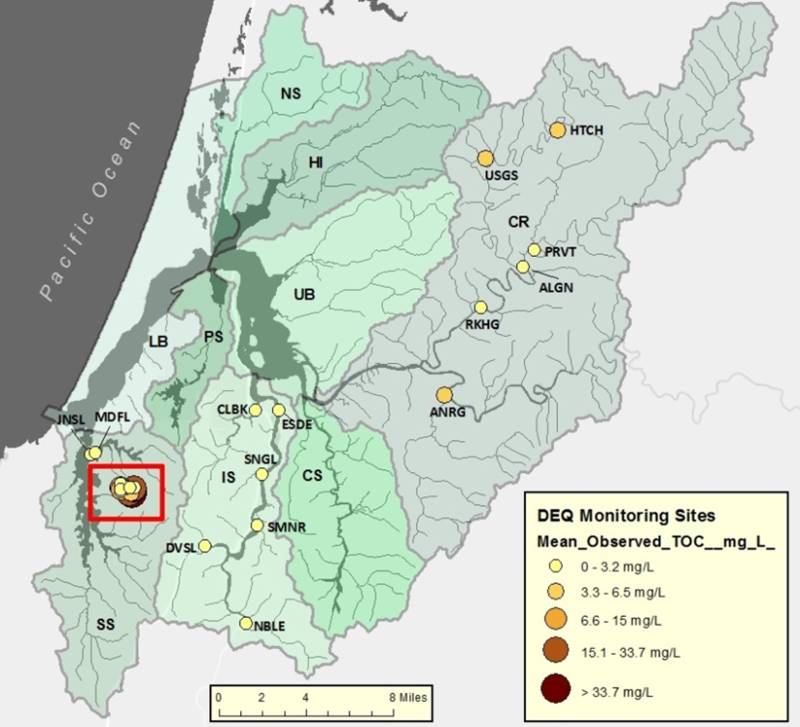 The Oregon Department of Environmental Quality (ODEQ) has monitored total organic carbon (TOC) in the South Slough, Isthmus Slough, and Coos River subsystems (Figure 1)(ODEQ 2001, 2007a, 2007b, 2009a, 2009b). TOC sampling is sporadic, with the most recent data coming from 2009 (Table 1). 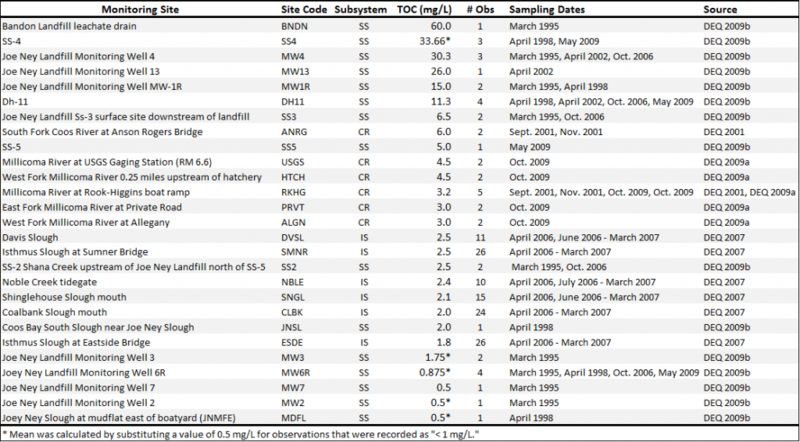 The highest TOC levels were recorded in the South Slough subsystem near the Joe Ney Landfill (closed in 2013 and most recently used exclusively for construction debris)(see sidebar). The Coos Bay/North Bend Water board monitored TOC from 2010-2012 in the Pony Slough (Pony Creek and Merritt Lake) and Lower Bay (North Spit) Subsystems as part of their drinking water program (Water Board 2012). TOC levels in Pony Slough and the Lower Bay were 3-4 mg/L on average over these years (Table 2). These levels are similar to the mean observed concentrations at ODEQ sites at South Slough, Isthmus Slough, and Coos River. Figure 1. 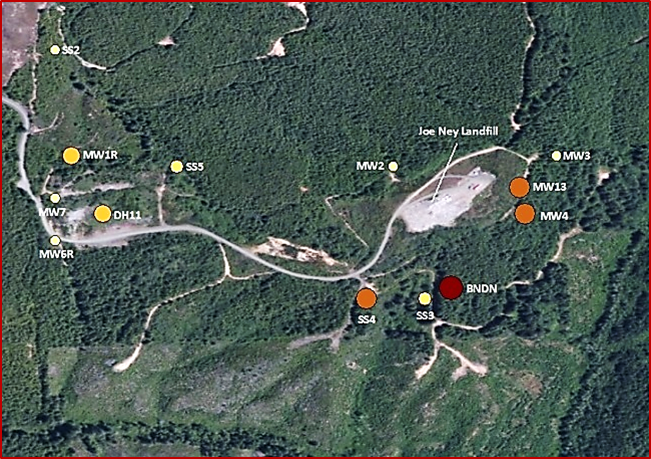 Location of ODEQ TOC monitoring sites and range of mean observed TOC concentrations at each site. Data: ODEQ 2001, 2007a, 2007b, 2009a, 2009b. Color aerial photo insert shows the number and location of TOC monitoring sites at or near the former Joy Ney dump site. Subsystem codes: SS-South Slough, LB-Lower Bay, PS-Pony Slough, IS-Isthmus Slough, UB-Upper Bay, NS-North Slough, HI-Haynes Inlet, CR-Coos River, CS-Catching Slough. Dissolved organic carbon (DOC) is a component of TOC, the measurement of which allows for particularly accurate TOC assessments in the water column. Unfortunately, little is known about the level of DOC in the Coos estuary. What we do know comes from Pregnall (1983) who studied primary production in South Slough to help quantify DOC produced by Coos estuary biota. His findings suggest that photosynthesis of South Slough intertidal algae (Enteromorpha prolifera) releases 0.13-0.57 mg of DOC per gram of dry weight biomass per hour. This rate was shown to increase in response to changes commonly associated with estuarine environments such as daily salinity fluctuations. 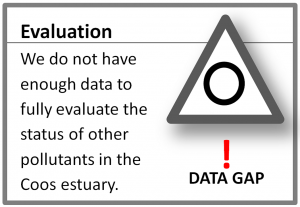 More research is needed to fully understand estuarine DOC dynamics in the Coos estuary and how measuring DOC concentrations can be used to improve water quality assessments. TOC can be thought of as the sum of particulate organic carbon (POC) and dissolved organic carbon (DOC). While POC settles in the sediment (see Chapter 10: Sediment Contamination in the Coos Estuary), DOC is transported from the sediment to the water column by a variety of natural and human activity-related processes (e.g., diffusion, bioturbation, bioirrigation, pore water advection, sediment resuspension)(Burdige 2006). Swett (2010) explains that estuarine sediments release significant amounts of DOC due to highly active microbial communities. He adds that, due to its ability to bind to metals such as mercury, DOC is a water quality concern, because it can effectively transport pollutants into the water column. Research suggests that organic carbon may also transport pesticides and herbicides (Wijayaratne and Means 1984) as well as biphenyls (PCBs)(Brownawell and Farrington 1986) into the water column from contaminated sediments. Additionally, high TOC levels in source waters have been shown to result in harmful water treatment byproducts (e.g., trihalomethanes)(Fleck et al. 2007). Bauer and Bianchi (2011) explain that estuaries are complex systems involving the exchange of carbon between terrestrial, marine, and atmospheric sources. They point out that the complexity of biogeochemical processes in estuaries is compounded by temporal variability. For example, estuarine biogeochemical processes respond to twice daily tidal flooding, daily or weekly storm events, seasonal or monthly changes in temperature and precipitation, and multi-year to decades-long changes in long term climatic regimes (e.g., El Niño Southern Oscillation and Pacific Decadal Oscillation). In addition to these natural processes, estuarine carbon cycling is carried out against a backdrop of human land use activities, which can further complicate an already intricate process (Bauer and Bianchi 2011). Consequently, we have a limited understanding of the role of DOC in governing the flux of organic matter and trace metals in coastal and estuarine systems (Martin et al. 1995). Table 3. Dissolved metals found in aquatic systems. Metals can readily dissolve in water, and can find their way into estuarine waters from various sources including manufacturing, mining and farming activities (the latter featuring land-applied herbicides and pesticides), and air pollution from fossil fuel combustion (USEPA 2007a). Many metals (e.g., iron, copper ) are also naturally abundant elements found in coastal watersheds (Shacklette and Boerngen 1984; USEPA 2007b). Table 3 summarizes the dissolved metals discussed below. Water quality criteria for dissolved metals have been developed for both aquatic life and human health (ODEQ 2014a; USEPA 1993, 2007a, 2007b, 2009). For aquatic life criteria, dissolved metal standards are evaluated using an acute criterion (CMC) and a chronic criterion (CCC)(see sidebar). For human health, standards are classified into categories for the safe consumption of 1) water and aquatic organisms, and 2) aquatic organisms only. Figure 2 summarizes the organizational structure of dissolved metal standards for each pollutant. Data describing dissolved metal concentrations are available in the Pony Slough, Sough Slough, Coos River, and Isthmus Slough subsystems (Figure 3 and Table 4)(ODEQ 1995, 1998a, 2002, 2006a, 2006b, 2006c, 2007a, 2007b, 2009a, 2009b; Water Board 2012). From 1998 to 2012, 13 sites in the study area (including the subsystems listed above)(Figure 4 and Table 3) were listed under the Clean Water Act for insufficient data or as sites of “potential concern”. These listings reinforce the fact that we don’t yet have enough information to form a comprehensive understanding of the status of dissolved metals in the Coos estuary. 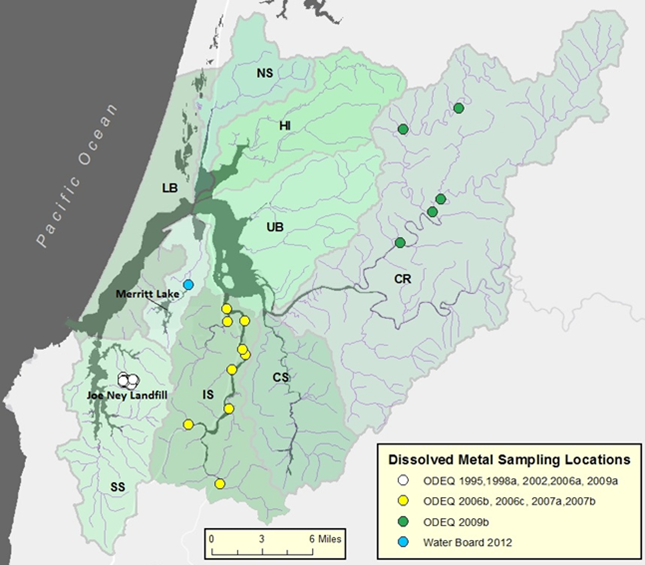 elevated concentrations of dissolved metals (Coos Bay in 1998 and Day and Storey Creeks in 2004). The remaining 10 sites were listed due to informational gaps (Table 3)(ODEQ 1998b, 2004, 2012). The status of specific dissolved metals in the Coos estuary and surrounding area is detailed below. 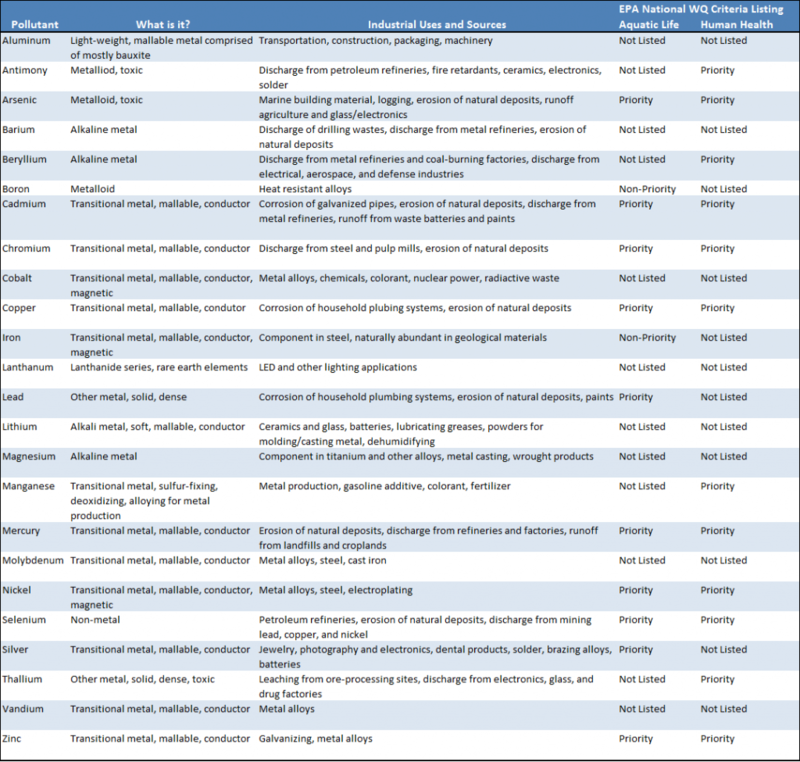 This inventory presents USEPA standards for both aquatic life and human health. However, the toxic effects of exposure focus on human health, because the effects on aquatic life can vary significantly by species and environmental conditions (e.g., pH, organic content, sediment characteristics, conductivity, etc. 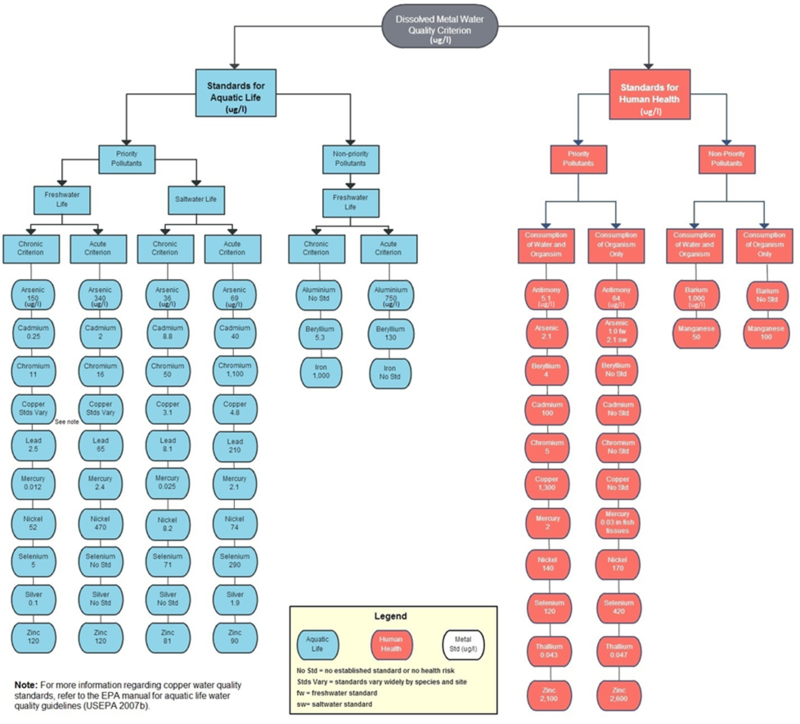 )(USEPA 1980; USEPA 2007b). Dissolved aluminum (1995-2009) concentrations appear to be higher in Isthmus Slough than in South Slough or Pony Slough. Aluminum is a non-priority pollutant for aquatic life standards (see sidebar)(USEPA 1993). Antimony concentrations (2005-2009) in South Slough at the former Joe Ney Landfill Disposal Site (JNDS) meet USEPA standards for human consumption of both water and aquatic organisms (Table 4). In 2004, Day Creek (South Slough), Mettman Creek (Upper Bay), as well as Morgan Creek and the West Fork of the Millicoma River (Coos River) were all listed due to insufficient information (Table 3)(ODEQ 2004). Antimony is a priority pollutant, meaning that it is a toxic pollutant with established chemical standards that is frequently found in water (USEPA 1993, 2014). Human exposure to antimony can affect the cardiovascular (heart and blood vessels) and respiratory (breathing) systems, but is not known to have any cancer effects (CDC 2014). At South Slough’s JNDS, arsenic concentrations (1995-2009) may be harmful to saltwater aquatic life. Elevated arsenic concentrations at South Slough’s JNDS may not meet USEPA recommended concentrations for the safe human consumption of both water and aquatic organisms. In 2012, arsenic concentrations in the Pony Slough subsystem at Merritt Lake met USEPA guidelines (Table 4). In 2004, arsenic was listed for insufficient information in Storey and Day Creeks (South Slough), Mettman Creek (Upper Bay), and Morgan Creek and the West Fork of the Millicoma River (Coos River)(Table 3)(ODEQ 2004). Arsenic is a priority pollutant for both aquatic life and human health (USEPA 1993). Human exposure to arsenic can affect the dermal (skin), gastrointestinal (digestive), hepatic (liver), neurological (nervous system), and respiratory (breathing) systems. It is a known carcinogen (CDC 2014). In 2004, barium was listed for insufficient information in Storey and Day Creeks (South Slough), Mettman Creek (Upper Bay), and Morgan Creek and the West Fork of the Millicoma River (Coos River)(Table 3)(ODEQ 2004). The data that are available suggest that average barium concentrations (1995-2009) at South Slough’s JNDS appear to meet the USEPA standards for safe human consumption of water and aquatic organisms, but maximum observed concentrations do not meet these standards (Table 4). Barium is a non-priority pollutant (USEPA 1993). However, human exposure to barium may affect the cardiovascular (heart and blood vessels), gastrointestinal (digestive), and reproductive (producing children) systems. It does not have any cancer effects (CDC 2014). In 2004, beryllium was listed for insufficient information in Storey and Day Creeks (South Slough), Mettman Creek (Upper Bay), and Morgan Creek and the West Fork of the Millicoma River (Coos River)(Table 3)(ODEQ 2004). However, the data that are available suggest that dissolved beryllium concentrations (1995-2009) in South Slough’s JNDS meet USEPA standards for both aquatic life and human health (Table 4). Beryllium is a priority pollutant for human health (USEPA 1993). Human exposure to beryllium may affect the gastrointestinal (digestive), immunological (immune system), and respiratory (breathing) systems. It is a known carcinogen (CDC 2014). Average boron concentrations (1995-2009) are higher in Isthmus Slough than in either Sough Slough JNDS or Pony Slough at Merritt Lake. However, the highest maximum observed concentration occurred in South Slough at JNDS (Table 4). The USEPA has not established water quality guidelines for boron. In 2004, cadmium was listed for insufficient information in Storey and Day Creeks (South Slough), Mettman Creek (Upper Bay), and Morgan Creek and the West Fork of the Millicoma River (Coos River)(Table 3)(ODEQ 2004). The available data suggest that cadmium concentrations in the study are low. From 1995-2009, ODEQ made 38 cadmium observations at South Slough’s JNDS. 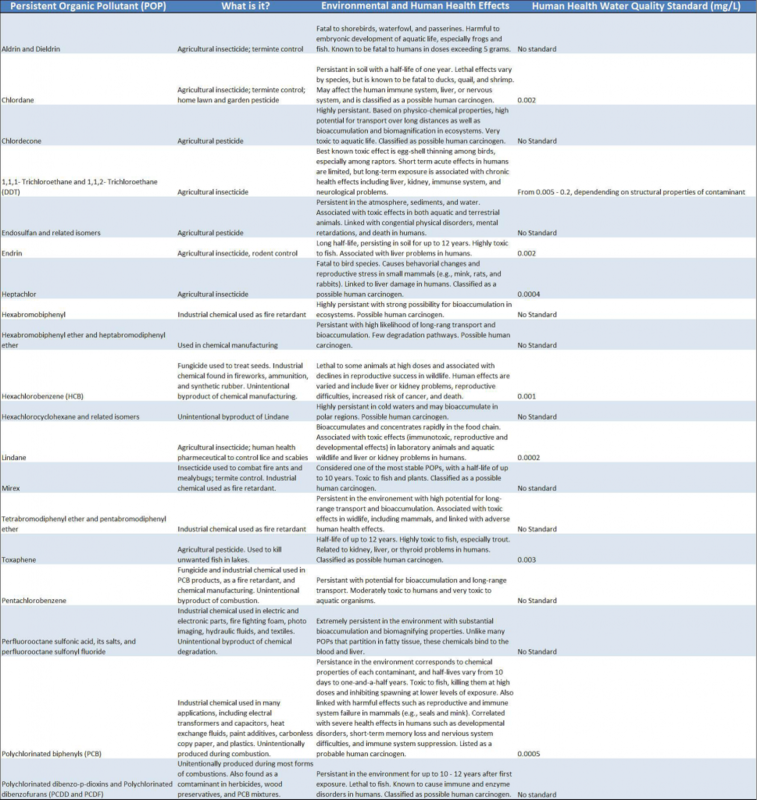 All of these observations were below detectable limits, indicating that cadmium concentrations at JNDS likely meet USEPA standards for human health. USEPA standards for freshwater aquatic life, however, are much closer to detectable limits. Therefore, it’s difficult to know if the JNDS cadmium concentrations meet the freshwater aquatic life standard for indefinite exposure (Table 4). Cadmium is a priority pollutant (USEPA 1993). Human exposure to cadmium may affect the cardiovascular (heart and blood vessels), gastrointestinal (digestive), neurological (nervous system), renal (urinary and kidneys), reproductive (producing children), and respiratory (breathing) systems. It is a known carcinogen (CDC 2014). Chromium concentrations (1995-2009) in South Slough’s JNDS meet USEPA standards for both aquatic life and human health (Table 4). Morgan Creek and the West Fork of the Millicoma River (Coos River)(Table 3)(ODEQ 2004). Chromium is a priority pollutant (USEPA 1993). Human exposure to chromium may affect the immunological (immune system), renal (urinary and kidneys), and respiratory systems. It is a known carcinogen (CDC 2014). About half of the cobalt observations (1995-2009) at South Slough’s JNDS are below detectable limits, indicating that the accuracy of monitoring efforts could be improved by more complete information (Table 4). USEPA has not established water quality guidelines for cobalt (USEPA 1993). Copper concentrations at South Slough’s JDNS (1995-2009) as well as Pony Slough at Merritt Lake (2012) appear to meet the USEPA standard for safe human consumption. However, brief exposure to these sites may be harmful to saltwater aquatic life (Table 4). In 1998, copper was listed as a potential concern for aquatic life in Coos Bay (Upper Bay)(ODEQ 1998b). In 2004, it was listed for insufficient information in Storey and Day Creeks (South Slough), Mettman Creek (Upper Bay), and Morgan Creek and the West Fork of the Millicoma River (Coos River)(Table 3)(ODEQ 2004). Copper is a priority pollutant (USEPA 1993). Human exposure to copper may affect the gastrointestinal (digestive), hematological (blood forming), and hepatic (liver) systems. It does not have any cancer effects (CDC 2014). Iron concentrations in the Coos River subsystem (2009) as well as in Isthmus Slough (2006-2007) and South Slough’s JNDS (1995-2009) may be harmful to freshwater aquatic life (Table 4). In 2004, iron was listed as a potential concern for both aquatic life and human health at Day and Storey Creeks (South Slough). In 2012, it was listed for insufficient information at Mettman Creek (Upper Bay) as well as the following waters in the Coos River subsystem: Daniels Creek, East Fork Millicoma, West Fork Millicoma, Morgan Creek, and South Fork Coos (Table 3)(ODEQ 2004). Iron is a non-priority pollutant. Lead observations at Pony Slough Merritt Lake (2012) and South Slough’s JNDS (1995-2009) seem to meet USEPA standards for aquatic life (Table 4). In 1998, lead was listed as a potential concern for aquatic life in Coos Bay (Upper Bay)(ODEQ 1998b). In 2004, it was listed for insufficient information in Day Creek (South Slough), Mettman Creek (Upper Bay), and Morgan Creek and the West Fork of the Millicoma River (Coos River)(Table 3)(ODEQ 2004). Only sixteen percent of lanthanum observations at South Slough’s JNDS (1995-2009) are above detectable limits, indicating that accuracy of cobalt monitoring efforts could be improved by more complete information (Table 4). USEPA has not established water quality guidelines for lanthanum. Lithium concentrations appear to be an order of magnitude higher in Isthmus Slough (2006-2007) than at South Slough’s JNDS (1995-2009) or in the Coos River (2009) subsystem (Table 4). USEPA has not established water quality guidelines for lithium. Magnesium concentrations are much higher in Isthmus Slough (2006-2007) than at South Slough’s JNDS (1995-2009) or in the Coos River (2009) subsystem (Table 4). USEPA has not established water quality guidelines for magnesium. 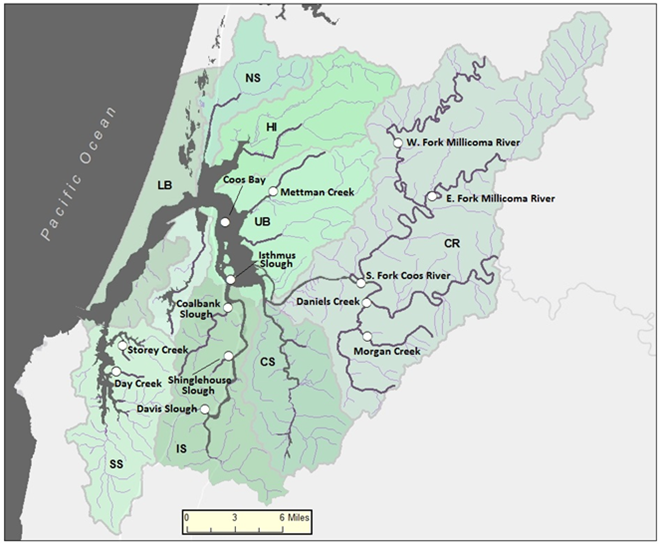 In 2004, Manganese was listed as a potential concern for human health in both Day and Storey Creek (South Slough). It was also listed for insufficient information at Mettman Creek (Upper Bay) as well as Morgan Creek and the West Fork of the Millicoma River (Coos River)(Table 3)(ODEQ 2004). In 2012, Coalbank, Davis, Isthmus, and Shinglehouse Sloughs (Isthmus Slough subsystem) were all listed as informational gaps (Table 3)(ODEQ 2012). The available data suggest that manganese concentrations may not meet USEPA standards. The estimated average manganese concentration does not meet the USEPA guideline for safe human consumption of either water or aquatic organisms in Isthmus slough (2006-2007); nor does it meet these standards at South Slough’s JNDS (1995-2009). In the Coos River subsystem (2009), maximum observed concentrations do not meet USEPA standards for safe human consumption (Table 4). Manganese is a non-priority pollutant (USEPA 1993). However, human exposure to manganese may affect the cardiovascular (heart and blood vessels), hepatic (liver), neurological (nervous system) and respiratory (breathing) systems. It does not have any cancer effects (CDC 2014). Indefinite exposure to mercury concentrations at South Slough’s JNDS (1995-2009) may be harmful to both freshwater and saltwater aquatic life. However, mercury concentrations appear to meet the USEPA recommended standard for safe human consumption of water (Table 4). For a discussion of mercury in fish tissues, see Chapter 10: Sediments in the Coos Estuary and Lower Coos Watershed. In 2004, mercury was listed for insufficient information at Day Creek (South Slough)(Table 3)(ODEQ 2004). Mercury is a priority pollutant for both aquatic life and human health (USEPA 1993). Human exposure to mercury may affect the gastrointestinal (digestive), neurological (nervous system), ocular (eyes), and renal (urinary and kidneys) systems. It does not have any cancer effects (CDC 2014). Only 21% of molybdenum observations at South Slough’s JNDS (1995-2009) were above detectable limits, indicating that the accuracy of monitoring efforts could be improved by more complete information (Table 4). USEPA has not established water quality guidelines for molybdenum. Dissolved nickel concentrations at South Slough’s JNDS (1995-2009) easily meet USEPA standards for safe human consumption of both water and aquatic organisms (Table 4). In 2004, nickel was listed for insufficient information in Storey and Day Creeks (South Slough), Mettman Creek (Upper Bay), and Morgan Creek and the West Fork of the Millicoma River (Coos River)(Table 3)(ODEQ 2004). Nickel is a priority pollutant for both aquatic life and human health (USEPA 1993). Human exposure to nickel may affect the cardiovascular (heart and blood vessels), dermal (skin), immunological (immune system), and respiratory (breathing) systems. It is a known carcinogen (CDC 2014). In 2004, selenium was listed for insufficient information in Storey and Day Creeks (South Slough), Mettman Creek (Upper Bay), and Morgan Creek and the West Fork of the Millicoma River (Coos River)(Table 3)(ODEQ 2004). However, the available data suggest that selenium concentrations at South Slough’s JNDS (1995-2009) meet USEPA standards for both aquatic life and human health. Selenium is a priority pollutant for both aquatic life and human health (USEPA 1993). Human exposure to selenium may affect the dermal (skin), and reproductive (producing children) systems. It is reasonably anticipated to be a carcinogen (CDC 2014). Indefinite exposure to dissolved silver at South Slough’s JNDS (1995-2009) may be harmful to freshwater aquatic life (Table 4). In 2004, silver was listed for insufficient information in Storey and Day Creeks (South Slough), Mettman Creek (Upper Bay), and Morgan Creek and the West Fork of the Millicoma River (Coos River)(Table 3)(ODEQ 2004). Silver is a priority pollutant for aquatic life (USEPA 1993). Although it is not listed as a priority pollutant for human health, exposure to silver is associated with harmful health effects to the renal (urinary and kidneys) and reproductive (producing children) systems. It does not have any cancer effects (CDC 2014). All twenty thallium observation at South Slough’s JNDS (1995-2009) are below detectable limits. However, the estimated average concentration indicates that thallium concentrations at JNDS may not meet USEPA standards for safe human consumption of either water or aquatic life (Table 4). In 2004, thallium was listed for insufficient information in Day Creek (South Slough), Mettman Creek (Upper Bay), and Morgan Creek and the West Fork of the Millicoma River (Coos River)(Table 3)(ODEQ 2004). Thallium is a priority pollutant for human health (USEPA 1993). Human exposure to thallium may affect the gastrointestinal (digestive), hepatic (liver), neurological (nervous system), and renal (urinary or kidneys) systems. It does not have any cancer effects (CDC 2014). Only 8% of all vanadium observations at South Slough’s JNDS (1995-2009) are above detectable limits, indicating that the accuracy of monitoring efforts could be improved by more complete information. USEPA has not established water quality guidelines for vanadium. Human exposure to vanadium may affect the cardiovascular (heart and blood vessels), gastrointestinal (digestive), renal (urinary and kidneys), reproductive (producing children), and respiratory (breathing) systems. It does not have any cancer effects (CDC 2014). Dissolved zinc concentrations at South Slough’s JNDS (1995-2009) easily meet USEPA standards for both aquatic life and human health (Table 4). Zinc is a priority pollutant for both aquatic life and human health (USEPA 1993). Human exposure to zinc may affect the gastrointestinal (digestive), hematological (blood forming), and respiratory (breathing) systems. It does not have any cancer effects (CDC 2014). Figure 4. Location of 303d-listed sites (1998-2012). Source: ODEQ 1998, 2004, 2012. “Persistent organic pollutants” (POPs) are widely distributed herbicides, pesticides, insecticides, and other biocides that are internationally recognized for their potential to cause environmental damage (see “Stockholm Convention” sidebar). In addition to POPs, tributyltin (TBT), an anti-fouling chemical found in boat bottom paints, has historically been a concern in the Coos estuary (Wolniakowski et al. 1987). Table 5 details the properties of the most common POPs and provides their associated water quality standards. Although little is known about dissolved POPs and TBT in the Coos estuary, what we do know comes from the Coos Bay/North Bend Water Board, which monitors Merritt Lake (Pony Slough Subsystem) for eight POPs including aldrin and dieldrin, chordane, DDT, endrin, heptachlor, HCB, PCBs, and toxaphene. Since the monitoring program began in 1985, the Water Board has not recorded any POPs observations above detectable limits (Water Board 2012). Cornu et al. (2012) note that a wide range of pesticides, including POPs such as DDT, have been detected by ODEQ in low (“unquantifiable”) amounts at 29 sites in the Coos Basin. Although the location of many these sites is undisclosed, it is clear that sampling occurred at no fewer than three Sough Slough locations, including Joe Ney Slough, Collver Point, and Brown’s Cove (ODEQ 2014b). For additional information about POPs, TBT, biocides, and other contaminants, refer to Chapter 10: Sediment Contamination in the Coos Estuary. The Oregon Department of Environmental Quality (ODEQ) monitors groundwater at the site with semi-annual sampling/analyses using a network of 18 monitoring wells, and 4 residential wells. Surface water is also monitored on a semi-annual basis with samples collected from 5 locations. These monitoring points were established between 1989 through 1999 during the course of several environmental investigations conducted at this site. Based on groundwater monitoring results, landfill activities have affected groundwater, and for that reason, Coos County has prepared a remedial investigation work plan for this site which led to the County’s closure of the dump. Acute Criterion (CMC) – The highest concentration to which aquatic life may be exposed briefly without resulting in adverse effects. Chronic Criterion (CCC) – The highest concentration to which aquatic life may be exposed indefinitely without resulting in adverse effects. The Stockholm Convention on Persistent Organic Pollutants is a multinational agreement intended to eliminate or mitigate the production/use of harmful Persistent organic pollutants (POPs).POPs are “organic” (i.e., carbon-based) pollutants with high potential for environmental damage. In 2001, the Convention identified 12 priority POPs, and an additional nine POPs were added in 2009. Long-range transport of POPs is often facilitated by the migration of animals that have been exposed to them. Due to the characteristics of POPs, predatory animals that are high up the food chain, such as fish, raptors, mammals, and humans, are at elevated risk for absorbing high POP concentrations. Table 5. Properties of the most common POPs. Source: Stockholm Convention 2008. Brownawell, B. J. and J. W. Farrington. 1986. Biogeochemistry of PCBs in Interstitial Waters of a Coastal Marine Sediment. Geochimica et Cosmochimica Acta. 50: 157-169. Burdige, D. J. 2006. Geochemistry of marine sediments (Vol. 398). Princeton: Princeton University Press. Buszka, P. M., J. Fitzpatrick, L. R. Watson, and R. T. Kay. 2007. Evaluation of ground-water and boron sources by use of boron stable-isotope ratios, tritium, and selected water-chemistry constituents near Beverly Shores, northwestern Indiana, 2004: U.S. Geological Survey Scientific Investigations Report 2007–5166, 46 p.
Coos Bay/North Bend Water Board (Water Board). 2012. [Drinking Water Program Data]. Unpublished raw data. Accessed 22 May 2014 from the Estuarine and Coastal Sciences Laboratory of the South Slough National Estuarine Research Reserve. Cornu, C.E., J. Souder, J. Hamilton, A. Helms, R. Rimler, B. Joyce, F. Reasor, T. Pedersen, E. Wright, R. Namitz, J. Bragg, and B. Tanner. 2012. Partnership for Coastal Watersheds State of the South Slough and Coastal Frontal Watersheds. Report prepared for the Partnership for Coastal Watersheds Steering Committee. South Slough National Estuarine Research Reserve and Coos Watershed Association. 93 pp. Fleck, J.A., M.S. Fram, and R. Fujii. 2007. Organic Carbon and Disinfection Byproduct Precursor Loads from a Constructed, Non-Tidal Wetland in California’s Sacramento-San Joaquin Delta. San Francisco Estuary and Watershed Science. 5: 24 pp. Martin, Jean-Marie, Min-Han Dai, and Gustave Cauwet. 1995. Significance of Colloids in the Biogeochemical Cycling of Organic Carbon and Trace Metals in the Venice Lagoon (Italy). Limnology and Oceanography. 40 (1), 119-131. Oregon Department of Environmental Quality (ODEQ). 1998b. [303d-listed sites 1998]. Unpublished raw data. Accessed 30 May 2014 from the Estuarine and Coastal Sciences Laboratory of SSNERR. Oregon Department of Environmental Quality (ODEQ). 2004. [303d-listed sites 2004]. Unpublished raw data. Accessed 30 May 2014 from the Estuarine and Coastal Sciences Laboratory of SSNERR. Oregon Department of Environmental Quality (ODEQ). 2012. [303d-listed sites 2012]. Unpublished raw data. Accessed 30 May 2014 from the Estuarine and Coastal Sciences Laboratory of SSNERR. Oregon Department of Environmental Quality (ODEQ). 2014a. 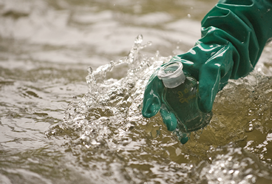 Water Quality Standards: Beneficial Uses, Policies, and Criteria for Oregon, Toxic Substances. [Table 30 and 40 of Division 41 Report 340-041-0033]. Pregnall, A.M. 1983. Release of Dissolved Organic Carbon from the Estuarine Intertidal Macroalga Enteromorpha prolifera. Marine Biology, 73, 37-42. Swett, Micaeal P., 2010. Assessment of Benthic Flux of Dissolved Organic Carbon in Estuaries Using the Eddy Correlation Technique. Master’s Thesis, University of Maine. Wijayarantne, R. D. and J. C. Means. 1984. Affinity of Hydrophobic Pollutants for Natural Estuarine Colloids in Aquatic Environments. Environmental Science and Technology. 18(2): 121-123. Wolniakowski, K. U., M. D. Stephenson, and G. S. Ichikawa. 1987. Tributyltin concentrations and pacific oyster deformations in Coos Bay, Oregon. Proceedings International Organotin Symposium. Marine Technology Society, Washington, DC. pp. 1438-1442.